Today, as you’ll probably have noticed, is the 200th anniversary of the Battle of Waterloo. One aspect of the battle that isn’t often mentioned is the reason for its name. The naming of battles isn’t always consistent and can tell you much about cultural assumptions. In the aftermath of Waterloo, the Prussians referred to the engagement as the battle of La Belle Alliance to signify the allied victory (La Belle Alliance is also the name of the inn where Napoleon had spent the preceding night). The French as befits their practical nature of the time called it the Battle of Mont-Saint-Jean, because the Mont-Saint-Jean ridge was where the French and Anglo-Dutch armies slugged it out. 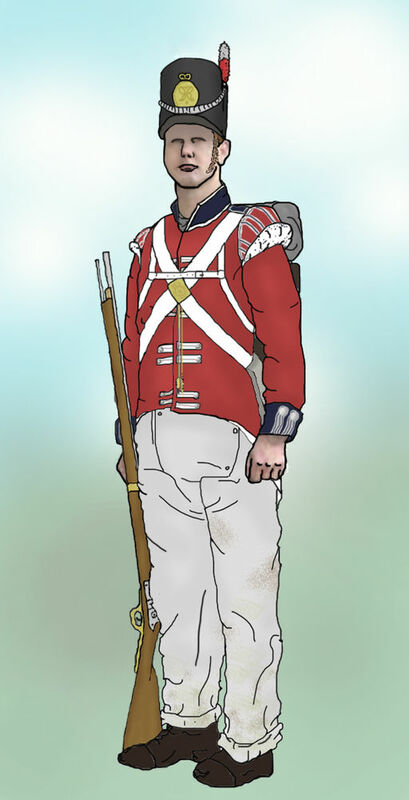 British soldier of 23rd Foot (Royal Welch Fusiliers). At Waterloo they fought under Mitchell’s 4th Brigade stationed near Hougoumont. With the heavy rain of the night before, the white trousers were said to be stained pink from dye running out of the jacket. Image (c) Jakebnb (own work). The British didn’t like either of those names and settled on Waterloo, the name of the village where they’d placed their headquarters. The fighting was several miles away, but Waterloo sounded more British, apparently, and so that is the name we call it in the English-speaking world. I know this trivia because thirty years ago I was mad keen on studying the Napoleonic Wars. Wargaming it too. I rediscovered something of a love of the period recently, when my brother gave me a collection of the stories of Brigadier Gerard by Sir Arthur Conan Doyle. Today I write military science fiction for a living and love doing so. Yet somewhere within the writer of 2015 is still the fourteen year old boy who stomped up the Lion’s Mound on one vacation to Belgium and surveyed the ridges, lanes and hamlets of the Mont-Saint-Jean ridge laid out before me. Nonetheless, despite all the colorful paintings of perfect dress uniforms of the period that still impress today, the Napoleonic and Revolutionary Wars were a brutal meatgrinder that blighted Europe across three decades. The celebrations and enactments playing out this week remind me of a perspective of a later war described by my friend, author, and veteran, Bob Atkinson. Authors write about war, in part, because life or death conflict places the people populating their stories under such intense stress that they are forced to reveal their character. Sometimes it’s good to remind ourselves that real wars are not generally fought for entertainment. “Ladies and gentlemen, please give a round of applause to those men and women of our armed forces, past and present, and those of our allies”. Now, I know San Diego is a major U.S. Navy and Marine Corps base, but I’ve never experienced anything of that nature here in the U.K. The sad fact is the British do not hold their armed forces in the same high regard as do the Americans. The recent experiences of our troops in Afghanistan is slowly changing this perhaps, but we are a long way behind the U.S.
My father arrived home from the battlefields of France in 1945 on a hospital ship. He’d been badly injured at Nijmegen in Holland. Three years earlier he’d come home in another hospital ship, also badly injured, this time in Malta. My dad just did not get along with the Germans. He never talked about the war, at least not until the last few years of his life, when he began to open up about his experiences. When the boys came home from the war, he told me, nobody wanted to know what they’d been through. Anyone who tried to talk about it was seen as a bore. A blowhard. So they learnt to bottle it up and get on with life. But their experiences stayed with them all their days. Many years ago, in the course of my work, I visited an old Highland croft-house in the back-end of beyond. The house was occupied by an old brother and sister, neither of whom had ever married. As the sister led me into the living room her brother scuttled into the kitchen, and remained there until I’d left. “You have to excuse my brother,” said the lady. “He’s been like this since he came home from a German prisoner of war camp in 1945”. He had been captured with the rest of the 51st Highland Division at St. Valery in France, and had spent much of the next five years slaving in a Polish salt mine. It broke my heart then, and it breaks it now to think of it: a soldier of the 51st, one of the finest divisions in the British army, reduced to this. Perhaps if he’d had counselling, been encouraged to talk about his experiences, the depression would not have taken him in his later years. My father has been dead a long time now, but I am so grateful for the hours I spent listening as he unburdened himself. So, if there is a moral to this story it is this: If you are fortunate enough to have a family member, still alive, who served in WW2, or any conflict since then, talk to them. Today. Don’t believe this rubbish that they won’t want to talk about it. Lend a sensitive ear and they will unburden themselves. It could be one of the most profound experiences of your life. Bob wrote this to coincide with the launch of The Last Sunset, his bestselling time travel novel set at the time of the Battle of Culloden in 1745/6. If you enjoyed that book, then you’ll be delighted to hear that the sequel and concluding novel, Red Sky in the Morning, is out now in paperback and for pre-order in Kindle format (although it might not be available to buy for a few hours as it’s just been published). This entry was posted in Uncategorized and tagged Bob Atkinson, British Army, culloden, fort william, Hougoumont, la belle alliance, Lochaber, SCottish Highlands, Veterans, waterloo. Bookmark the permalink. Thanks for the history lesson!!! Sad to hear that other nations don’t honor their veterans to the same degree that the States do. That said, mostly what we get in the States is lip service and platitudes. Sorry to hear that, SGT Mike. Though there are plenty of individuals even in the UK who appreciate service people. The same is true here too, but there is just as much of the platitudes, mostly from uncaring politicians. Glad to know that the UK honors their vets too!